Articular cartilage covering the end of joints allows them to glide smoothly, much like the Teflon on a frying pan. When there is loss of the cartilage, the joint grinds with motion and causes pain. Hand surgeons refer to the thumb as the “king of the digits.” This is because for all activity the thumb must be positioned for effective grip and pinch. The basilar thumb joint acts as a universal joint to position the thumb for activity. 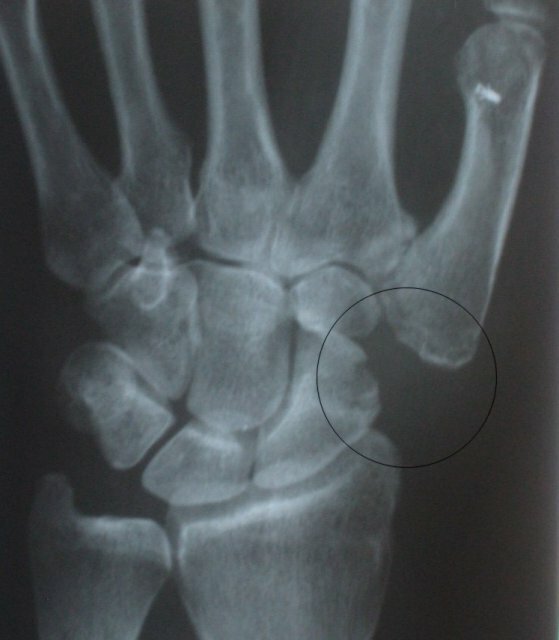 Figure above: The circle shows the areas associated with thumb arthritis—which includes the thumb metacarpal and trapezium. 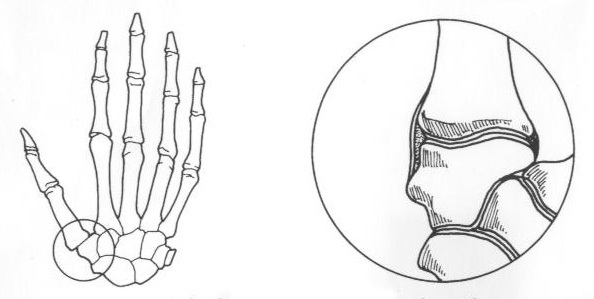 Osteoarthritis of the base of the thumb occurs in an approximately 3; 1 ratio of women to men. Women are typically affected earlier in life—typically after 40 years of age. Men affected by osteoarthritis typically are symptomatic later in life. The pain associated with arthritis typically progresses. Initial symptoms are then triggered with less activity and the pain becomes more constant. Stiffness of digits is another common complaint—although early in the disease morning stiffness is predominate. Patients with thumb arthritis complain of loss of grip and pinch strength. 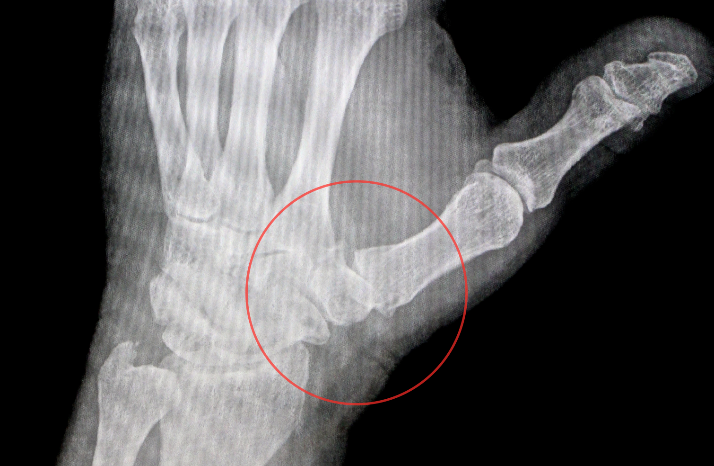 X-ray of left thumb showing decreased cartilage space between the metacarpal and the trapezium—there is also subluxation of the metacarpal on the trapezium. Treatment of thumb arthritis mirrors arthritis treatment for larger joints. Early in the disease activity modification may be helpful. Later stages may respond to anti-inflammatory agents such as naproxen or ibuprofen. 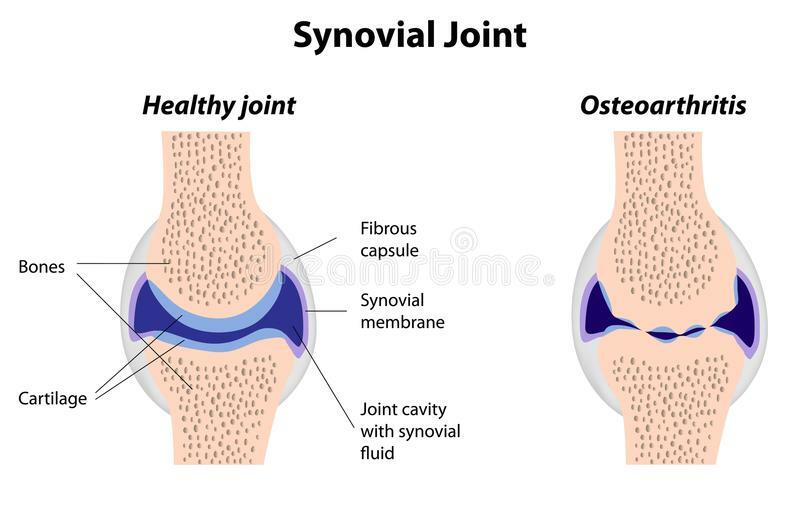 Often these medications are coupled with bracing to support the joint. Typically bracing is only utilized for activities which cause discomfort. Patients who still report pain may benefit from a steroid injection into the joint. Steroids are powerful anti-inflammatory medications and are often quite effective. These medications may be repeated 2 or 3 times per year. Risks of steroid injections may include depigmentation, tendon rupture, infection, and elevation of blood glucose. Patients who continue to have symptoms in spite of maximum conservative management candidates for surgery. Fusion of arthritis joints can decrease pain, but at the expense of motion—which is critical for good thumb function. More commonly, the trapezium bone is resected and a tendon is used to reconstruct the joint for function and stability.